The Weekly Voice is an exciting new feature on CrownHeights.info. Each Webisode is part of a weekly series of interviews with Lubavitchers from around the globe. And for our very first Webisode, we bring you Rabbi Hirshel Shifrin and Rabbi Levi Zarchi of Shifrin and Zarchi Quality Esrogim located on Kingston Avenue in Crown Heights. 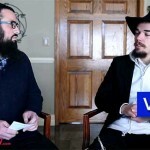 In this interview conducted during the days leading up to Sukkos, the rabbis speak about what makes an esrog kosher and what qualities do we look for in an esrog. very nice i really enjoyed this! good stuff , keep them coming.